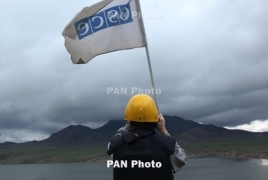 PanARMENIAN.Net - The OSCE Mission on Wednesday, September 12 conducted a planned monitoring of the ceasefire on the line of contact between the armed forces of Artsakh (Nagorno Karabakh) and Azerbaijan, to the east from the settlement of Akna. From the Artsakh Defense Army positions, the monitoring was conducted by Personal Representative of the OSCE Chairperson-in-Office (CiO) Ambassador Andrzej Kasprzyk and his Field Assistant Mihail Olaru (Moldova). The monitoring passed in accordance with the agreed schedule. From the Artsakh side, the monitoring mission was accompanied by representatives of the Republic of Artsakh Ministry of Foreign Affairs and Ministry of Defense.